With the recent release of Office 2011 for the Mac, Outlook makes a welcome return, spearheading the way toward full feature parity between Outlook on Windows and Mac. Finally, will your Mac users will be able to do everything their Windows counterparts can? 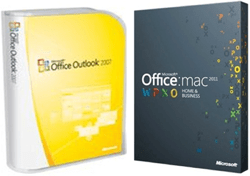 Is Outlook 2011 for Mac just an improvement on Entourage 2008 EWS edition, and will Mac users need something like VMware Fusion plus Outlook 2010 to gain all the features they need for full interoperability with Exchange? And with OWA becoming truly cross-platform, does this provide enough features to by-pass the desktop install of Outlook completely on the Mac and provide email access to Mac users via the browser? After a few weeks of usage, Outlook 2011 feels more like Entourage than than it does Outlook – it seems obvious what code it’s based upon and it’s certainly not inheriting anything from the Windows version. But as a mail client it feels more accomplished than older versions of Entourage did, and is easy to work with if you’re used to Outlook on a Windows PC. When it comes to OWA 2010 SP1 – There has been a lot of improvement over previous versions, but it seems that the OWA and Outlook teams don’t work closely together, as UI inconsistencies are common both in the way features work and are named (e.g. Calendar sharing features). This is muddled further as OWA’s Options / Exchange Control Panel is essential for Outlook 2010 operation, for example when configuring Unified Messaging features. Getting down to the nitty gritty of the features however and it’s a complex story. Outlook 2011 doesn’t have feature parity with either Outlook 2010, OWA 2010 or even Outlook 2007. It’s got a smattering of features from all three. OWA 2010 fairs a lot better when it comes to Exchange 2010 feature support (obviously), but misses out useful features like contacts importing that are present in competitor webmail applications like GMail. To make comparisons a little easier, I’ve went through and checked/tested the features that are most important to me and compiled a short comparison table. It’s now updated to cover Outlook 2011 SP1, but if you think anything is missing or needs amendment, let me know in the comments. Thanks for the comparisons – we are just about to go live with 2010 and OWA and this has helped my start a list. Sorry – helped ME start a list. Good article Steve. All in one place. Thanks for sharing. Excellent comparison, many thanks, but you don’t mention mailmerge into email, which you can’t do with OWA. It’s the integration between Outlook and the other Office and SharePoint components that make it so powerful. Steve, what about the outlook integration with Lync, we use that feature a lot for web conferencing , Live Meeting service & ..? What about the mailto: integration ? Thanks for the great information. Can mail retention information be seen in OWA? The retention policy information shows on each individual message in Outlook 2010 but I don’t see a way to get that same information showing in OWA. I found out the hard way that OWA does not display Contacts or Calendars if you have imported from a PST into an Online Archive after migration. We just did Notes to Exchange migration, where every Notes mailbox was exported first to PST, then ingested to an Online Archive. All users are to be using OWA and not the full Outlook Client. So no Contacts and no Calendars in OWA. We’re having login to 250 Outlook clients manually tonight and drag and drop from Online Archive to Main Mailbox. What is the difference in the connectivity to group calendars in SHarePoint? I’ve not had a chance to test this myself, but if I come across the opportunity will do any update the post. For OWA in particular, it doesn’t have any particular connectivty I am aware of unless the Calendar can be shared publicly in iCal format. Am not able to view multiple columns as we do in outlook for windows. That gives a gr8 comfort to search mails. Is that facility not in now? If yes, am disappointed. Something else is the “Sensitivity” setting from Outlook, where you can set Normal/Personal/Private/Confidential. this feature is not available in Mac Outlook 2011. This came up during a project where we were going to perform certain actions on emails based on this setting, but discovered that our many Mac users wouldn’t be able to take advantage of this. Hi, I am using Outlook 2011 for Mac. I want to be able to see the file names of attachments when i print an e-mail. How do i do this? Format Painter is a function from Outlook for Windows that I miss. Not sure if it was in Outlook 2010 for mac. And the “Find Related Messages” Option isn’t there. Thanx for your comparison! Because of a team-calendar, I had to install this M$-Outlook thing on my Mac today (I had to uninstall my previous M$-Office 2011 Installation by hand to get it installed …), and I was looking for the vote-buttons. Now I know that they are not available in M$-Outlook 2011. Excellent goods from you, man. I have understand your stuff previous to and you are just extremely great. I actually like what you have acquired here, really like what you’re stating and the way in which you say it. You make it entertaining and you still take care of to keep it smart. I cant wait to read far more from you. This is really a wonderful site. We would like to thank you yet again for the beautiful ideas you gave Jeremy when preparing her own post-graduate research and also, most importantly, for providing every one of the ideas in one blog post. In case we had been aware of your website a year ago, i’d have been rescued from the nonessential measures we were taking. Thanks to you. I truly enjoyed this content therefore i wanted to ask if perhaps men and women find out how to shield by themselves from spam email messages inside comming yr associated with 2012. Make sure you learn how to spam emails to generate income which approach you possibly can defend yourself from unsolicited mail. One of the things that I can’t seem to find relates to management of tasks. I can create tasks for myself, but the Task Request functionality, being able to assign tasks to others is missing from Outlook 2011. So for now, I pop open a VMWare session and create the task request in Windows, then come back to Mac for day-to-day operation. One of the things I didn’t like about Entourage is that the list of attachments in an email will not print. Now I find that Outlook 2011 won’t print the list of attachments either, but they do print on the PC version. This is a negative for someone who receives documents via email. Is it possible to print the list of attachments? Are you considering reviewing your table now that OL 2011 SP1 has been released? At least one change is in server side rules but I haven’t tested to see how extensive that was. I’m enjoying the new ‘resend’ command that I use daily in my work. Contact Groups (Distribution Lists) existing in Exchange Server – Can’t expand a group to see who is in the group before sending email. Can’t resend a message, only forward or reply. Can’t add additional columns (to list of emails) — “Columns” is grayed out in view menu (want to add “Size” ), also cannot rearrange columns. Can’t tell the exact Size of an email with embedded attachments. 2011’s implementation of Smart Folders is limited. For instance, I have a search in 2007 that shows me all my pending invitations that I use all the time to show me the invites I need to respond to. Can’t do it in 2011. One confusing note: the “CSV Contacts Import/Export” description mentions PSTs, which I think is a copy/paste error. Also, you’ve got enough features listed now it might be worth trying to break them up into categories to make it easier to find/compare them. Thanks for the comments. I think you are right, a re-write may be in order to split up in categories. Another thing that is disappointing on Outlook 2011 that Outlook 2010 has is tabbed calendars for viewing many shared calendars AND colors for those other calendars. Outlook 2011 for some stupid reason shows every shared calendar in the same color so it is next to impossible to see who’s calendar you are looking at without checking and unchecking the different calendars. Nice comparison by the way!!! You are right, Outlook 2011 isn’t a perfect Outlook replica on the Mac. One can only hope they improve it in service packs, as they did in Entourage. If you’ve been used to Outlook 2010 you won’t be blown away, but if you’ve come from earlier versions, like Outlook 2003 or Entourage it is a fantastic upgrade. OWA can both Ignore and Delete entire conversations (which I think probably qualifies for a different answer under Conversation Actions). Outlook 2010 has Addressing options, where you can set “Start with Global Address List”, “Start with Contacts folders” or “custom”. With Outlook 2011 it appears it wants to use contacts and recently used addresses first, then the directory. To my knowledge this cannot be edited anywhere. This is a real bummer because I’m now accidentally sending emails to co-workers home addresses (if I have them in my Contacts). No column based Inbox AND preview pane on the right (A great view if you get loads of email). If people expect that Outlook for Mac now was in sync with the PC version (like I did) they will be disappointed. Outlook 2011 is Entourage with a new GUI. Thanks Job I will add those and the OWA equivalent answers! Anyone know how to get the Voting Button to work in OWA 2010 SP1? Don’t believe it’s supported at the moment. There was an error in an earlier version of the doc. – Outlook for Mac uses the same Suggested Contacts folder that Outlook 2010 and OWA 2010 use, so I’d say “Roaming Autocomplete List” should be “yes”. – Outlook for Mac and OWA 2010 both support AD Rights Management Services; that might be worth a mention. – Outlook for Mac uses the OS-provided Spotlight feature for client-side search, so it has “instant search,” but it doesn’t use the Exchange content index. – Outlook for Mac provides a unified inbox for multiple Exchange accounts, a feature sadly omitted from Outlook 2010. Thanks Paul, all good points. I’ll amend the article later this evening. Good article. Does Outlook allow developers to build custom UIs? You can use Visual Studio to build add-ons for Outlook, and build completely custom UIs for the Exchange client using EWS. It’s not my area of expertise, though.